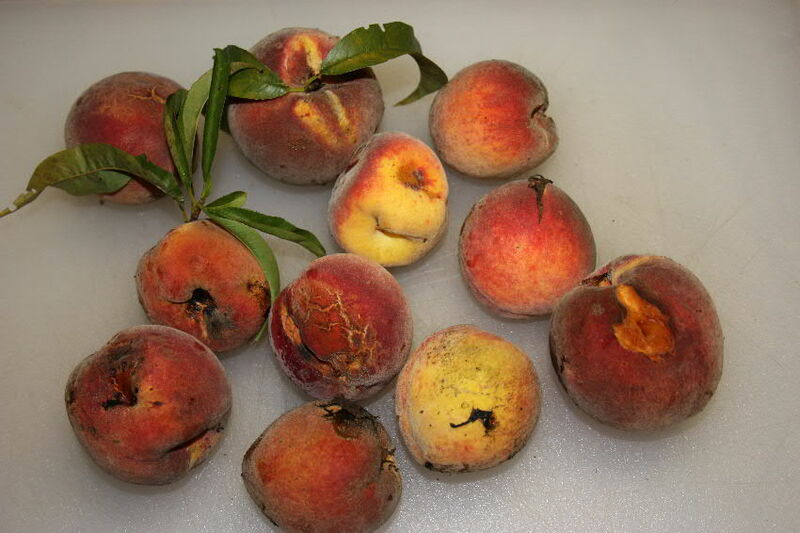 Wild peaches will almost always show bird, insect and fungal damage; but almost all of this fruit was able to be used. Peach seeds are, and/were, very often dispersed by people eating a peach and throwing the pit on the ground. These seeds yield genetically different fruits than their grafted parents. Uniformity is a necessity for the commercial peaches that we buy in stores, so all of the trees in commercial orchards are grafts of a very few varieties. Peaches are also a soft fruit, and the longer they remain on the tree the more likely they are to be bird picked or damaged by insects and fungi. Because wild trees are seldom treated, their peaches are never as attractive as the store products. It is tempting to allow the fruit to stay on wild trees until it is “eating soft.” This is not done in commercial orchards, and it is unrealistic to expect good results if the fruit is left on on wild trees too long. Unless it is a very large tree, wait until some of the fruit has gotten ripe enough to attract birds and insects and then pick nearly the entire tree, leaving only those peaches that are obviously very green. The fruit should still be firm to the touch, but not rock hard. It is O.K. if some has been attached by ants, or shows signs of external fungus infections. This will be trimmed away. Gather this fruit too. 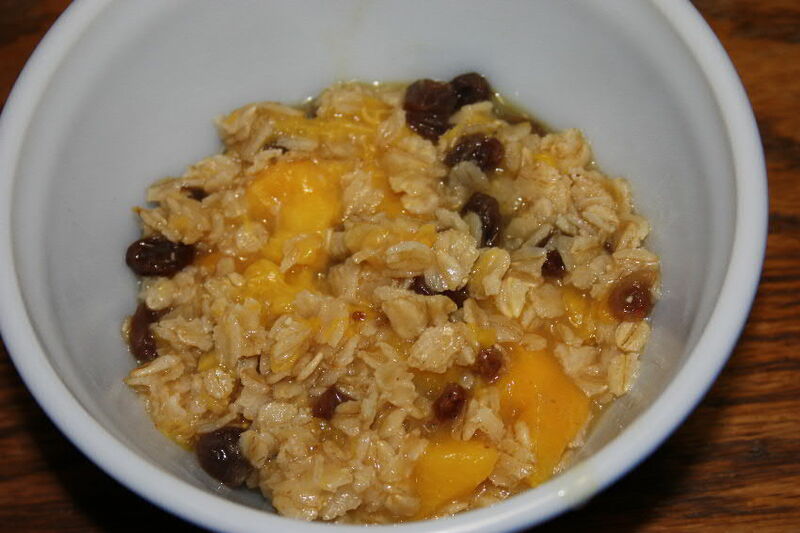 Wild peaches in oatmeal is an easy way to use the fruit. After boiling to the point that all are soft, these peaches may be used in cereal, pies or eaten with a little milk and sugar. They may also be canned or made into jelly. My healthy, tasty, but poor-looking attempt at a peach pie. My brave tree, which has been loosing its fight against fungus for a decade or more, yielded me sufficient peaches to make one pie. I am a meat guy, and not a baker. 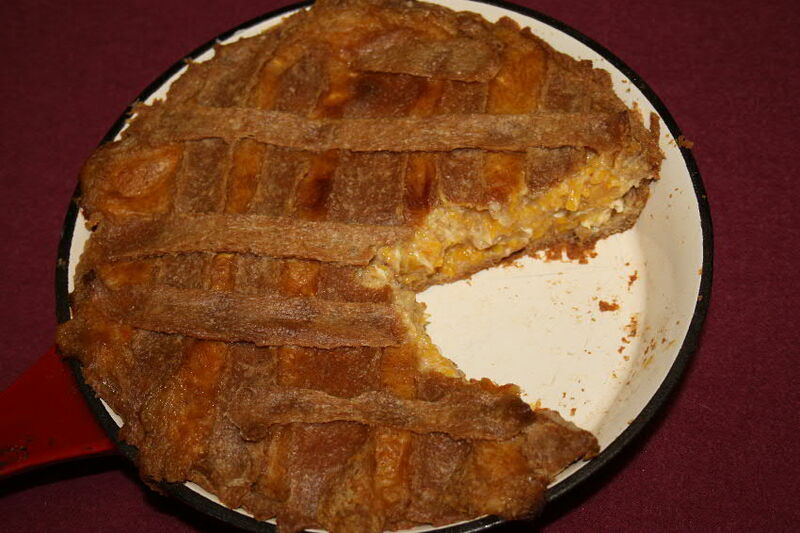 Nonetheless, I did an attempt at a pie with a whole-wheat crust made with bear lard (O.K. but not recommended), a little added Splenda for sweetening (that worked well), some butter substitute, two eggs and cooked it in an enamaled frying pan. Anyone with reasonable baking skills could have done much better. The point is that these wild peaches can yield good-eating products; despite their appearances and my poor attempt at pie baking. Each wild peach tree is unique. Another in my yard yields a yellow-fleshed fruit instead of the more traditional peach-colored variety. These are interesting trees, give interesting products and are fun to work with once you get past a few worms and insects. Keep in mind that this is real-world food, and not a semi-synthetic orchard product. If the insects like it, there is a good chance that you will too. Even so my pie was better than an “industrial” apple pie that I purchased in a chain resturant on a recent trip and described in an earlier post, “Industrial Food in America’s Heartland” on May 17, 2010.